New Research from American Express and Dun & Bradstreet show that mid-sized firms are responsible for more than half (51.7%) of U.S. job growth since 2011. This underscores the role BDCs play in providing vital growth capital to middle market businesses. From the report: Of the 51.8 million new jobs that were created since 2011, 26.8 million (or 51.7%) were created by middle market firms. 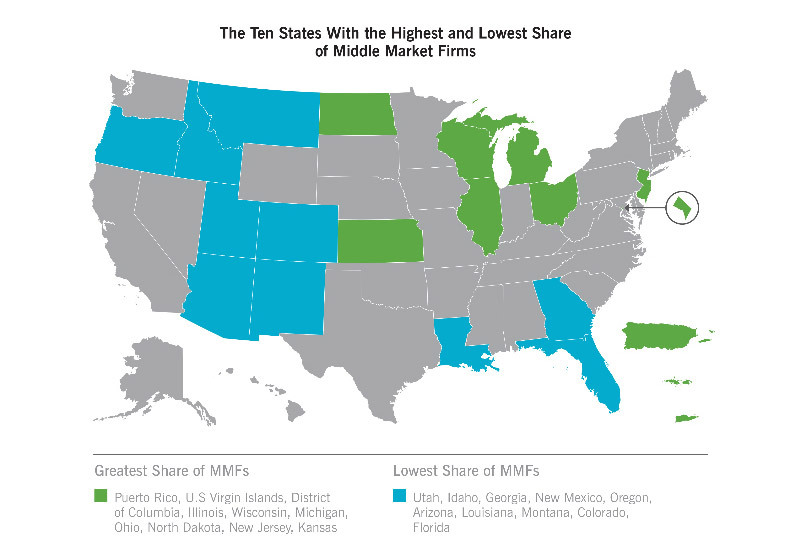 Middle market firms also lead the way in revenue growth and account for more than one quarter (26.8%) of all revenue produced by U.S. businesses, equating to roughly $9.3 trillion. Middle market companies experienced the greatest growth in overall numbers (83.9%), employment (103.3%) and revenue (99.9%) since 2011. The manufacturing and wholesale trade industries account for one-third of all middle market companies, and firms in both industries have grown by at least 120% since 2011. Graphic, courtesy of Business Wire.